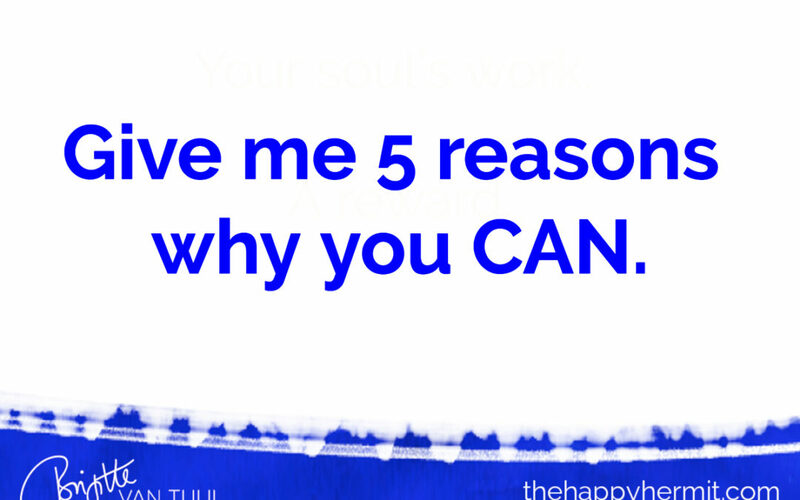 Give me 5 reasons why you CAN. You’re excited for a bit, and then…. Your mind starts coming up with allllll the reasons why you can’t do that / can’t have that / why this won’t be possible for you. None of these ‘reasons’ are necessarily true, nor realistic, but often you buy into them without even questioning them. Because they SOUND realistic, and when you don’t question them? You ALSO don’t have to deal with any fears, doubts, old pain or disappointments that unconsciously caused you to come up with these ‘reasons’ to begin with. And to your subconscious mind, safe = what it knows. Safe is how it’s always been. That’s just what happens when you start dreaming a bigger (or different. or new.) dream. Most people never question these ‘reasons’ and as a result, they never go for their TRUE dreams, they always settle for something (slightly) less than that, and it never occurs to them to try and see if maybe, just maybe, their true dream COULD be possible. But you don’t have to settle. You can CHOOSE to live a life limited by fear or a life fueled by your dreams. And no, that’s not always easy, and yes, that does require you to sometimes feel (highly) uncomfortable, stare fear in the face and not back down, and do things that scare the crap out of you every now and then. (That’s one of the reasons people hire coaches and mentors – AND it’s THE main reason why every great coach MUST know how to guide people THROUGH those fears, doubts & resistance. There are dozens of things you can do to shift your mind out of fear and back into the excitement of your dream. Make a list of all the reasons why you CAN do it. Why it WILL work out. And why it IS possible for you. It doesn’t have to be realistic – your fears aren’t either. It doesn’t have to be true – most fears are lies anyway. It’s OK if you repeat the same reason several times in slightly different words – ALL your fears & doubts are variations to 3 or so core limiting beliefs. And you keep repeating those without questioning them or telling yourself it’s not fair to keep saying the same thing over and over. What is that thing you TRULY want that triggers allll the ‘reasons’ why you cannot have it? Stop those thoughts RIGHT NOW. And give me 5 reasons why you CAN. AT LEAST 5 reasons, that is. So if you’re up for the challenge, go do that! But start with 5 AT LEAST. And notice what happens inside you when you do. Your TRUE dreams are waiting for you….and this is a great tool to help you step into them! P.S. : Need help connecting with your TRUE dream; committing to it and continue to GO for it until it’s manifested? And I currently have one spot open. Go see if it might be yours here.